Chinese businesspeople walk past private planes for sale at the Shanghai Hongqiao airport, on April 14, 2014. 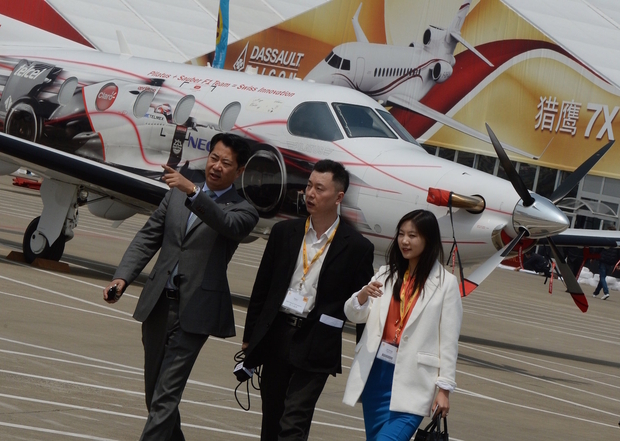 The market for private jets is a small but fast-growing aviation segment in China. By Wu Hongyuran, Liu Caiping, Ding Feng, and Yang Qiaoling, Caixin staff reporters. This article was first published by Caixin. Financial market supervisors admit that gaping holes pockmark the regulatory fences they’ve built in recent years to control the wealth management industry and protect its investors. By occasionally introducing new rules and regulations, supervisors such as the China Securities Regulatory Commission (CSRC) and the China Bank Regulatory Commission (CBRC) have tried to mend these fences and even erect new ones. But plenty of holes remain, reflecting what some call a regulatory failure to keep pace with the rapid growth and diversification of the wealth management sector. By some estimates, the value of wealth management products overseen by banks, trust funds, insurance firms, and other types of asset managers last year reached nearly 90 trillion yuan (U.S.$13.8 trillion). Now, as wealth management investment deepens and related assets under management continue to grow, risk warnings are surfacing in the financial sector. Some industry players are calling the loosely regulated business a bubble ready to pop. And some in the field—including government supervisors themselves—have raised doubts about the entire regulatory environment. In certain cases, obvious holes in the regulatory fence have been allowed to remain unplugged even after being identified as risk factors and targeted for action by government officials. In late 2014, for example, the CBRC decided to cut risk by ordering banks to separate their wealth management and lending businesses. A regulation was drafted and pushed forward. But it was never implemented, apparently due to disagreements inside the agency over the regulation’s details. A downturn in China’s stock markets that started in the summer has worked against wealth management investing as well. Insurance companies, which have had permission to sell these products since 2013, have been investing on the secondary market since July. But this hasn't been an easy ride, according to industry documents that Caixin has seen that say 12 insurers including Anbang, Foresea, and Guohua have seen their stock holdings lose value in recent months. A banking sector official who asked not to be named said he blames regulators for the cloud of risk now hanging over the wealth management business. Exacerbating that risk, he said, is the fact that regulators working for different agencies have failed to coordinate their work at a time when the complicated investment structures of wealth management products and the volatile equities market have made it hard to determine asset quality. “The asset management industry is now too messy,” he said. According to data compiled by Caixin, Chinese banks at the end of 2015 controlled the largest chunk of funds—roughly 23 trillion yuan—invested through the wealth management sector. Trusts were managing 16 trillion yuan, securities firms had 11.9 trillion yuan under management, insurance companies were handling 11 trillion yuan and fund companies oversaw 8.57 trillion yuan. Easy investing through the Internet and smartphones as well as the central government’s liberalization of interest rates have encouraged retail investors and big financial institutions to put their money in wealth management products. In turn, asset managers have been channeling funds raised through the sale of wealth management products into the country’s equity markets. A banking regulatory official said asset managers have been taking risks by betting on the highly volatile stock markets in Shanghai and Shenzhen. Others have funneled money into companies through private placements and corporate bond sales, the official said. People with knowledge of the matter said that at the end of 2015 funds from wealth management product investors had been converted into 7.4 trillion yuan worth of stocks, bonds, and all kinds of futures products. Of that amount, bank-managed wealth product investments had been funneled into about 1.7 trillion yuan worth of structured products. An employee of China Merchants Bank said that the bank’s executives were recently alerted to the fact that borrowing to cover stock market investments has been on the rise. Despite that alert and recent volatility on stock markets, however, several bank officials said equities are in fact not the riskiest targets for wealth product managers. Rather, they said, many have been sinking investor funds into private placement projects, which collectively win the prize for greatest risk. Banks are also increasingly engaged in an off-balance-sheet business called mezzanine financing, through which a bank and private equity firms form a partnership to provide bank loans to capital-thirsty companies in exchange for stakes. A bank risk control officer who asked not to be named said that about one-fifth of all wealth product-related assets managed by banks have been steered into mezzanine financing or similarly investments, including private placements, pre-IPO fundraisers, and company privatization projects. An executive working for the Jiangsu province branch of the Industrial and Commercial Bank of China said wise fund managers target only good companies for mezzanine financing, since this type of financing amplifies leverage risks. Following last year’s stock market selloffs, the bank risk control executive said, risks associated with mezzanine financing have increased. “It seems an equity market bubble pushed up by bank wealth management product funds is forming,” he said. Indeed, asset managers have been struggling to find good investment targets. An investment manager at one bank said that his office has “200 billion yuan to invest this year, but I have no idea where to invest it.” The best opportunities “are still in the secondary market and structured investing,” he said. In a January 26 report by the ratings firm Moody’s, the firm’s vice president, Christine Kuo, said that if equities are weak in 2016, asset quality and profitability pressures could mount for Chinese banks that lend for stock purchases, issue stock-related wealth management products, and provide custody services to stock funds. Moody’s anticipates “further increases in loan delinquencies, more defaults on corporate debt and some losses in wealth-management products” in 2016 “as more borrowers struggle to meet payments against the backdrop of high financial leverage and a downturn in their respective sectors,” said Kuo. A bank executive who handles wealth management products said he would like to see the industry change and adopt “real wealth management.” For now, though, the sector is facing headwinds from the credit market and interest rate fluctuations. For the most part, regulators have not intervened on behalf of wealth product investors by interfering with high-stakes investing by firms that sell these products. On the other hand, regulators have in recent years paid closer attention to capital pools formed by two or more financial institutions with money raised through short-term wealth management product sales. Such a pool is kept at an even level to be used for long-term investments, usually in property development or government construction projects, even while funds are flowing in and out as products are sold and mature. Asset managers can also take credit for at least some self-policing. Several people said that helping investors manage assets by supporting clearly defined projects is at the heart of the wealth management business in the country. Zhang Xuyang, the asset management department manager at China Everbright Bank, said he supports investment information disclosure and risk control measures for the wealth management industry. Wealth products should be subject to the same rules that govern publicly offered funds, he said, while fundraising, investment targeting, and investor protection practices should be standardized. It makes sense for government market supervisors to get behind these types of industry-improvement measures as a way to support the retail investors they’re supposed to protect, Zhang said. “Regulators should first and foremost make it clear that the essence of wealth management is managing money for clients,” he said. To date, however, regulators from the CSRC, CBRC, and the China Insurance Regulatory Commission (CIRC) have chosen to follow separate agendas at the expense of the kind of coordination that would be needed to heed Zhang’s advice. Rather than work together, each agency focuses on a specific segment of the financial industry—a pattern reinforced by government officials who attended a “work conference” for regulators in January. Segmentation of supervisory functions has been blamed for various degrees of regulatory arbitrage in the financial industry, particularly in the wealth management sector. On the plus side, segmentation has been praised as a spark for innovation. Officials from regulatory agencies who didn’t want their names published said top policymakers have the power to determine whether to approve the institutional and legal support that would open doors to unified, coordinated supervision. In the past, there have been instances of agency cooperation aimed at improving the financial sector. For example, in 2003 and 2004 the CBRC and CSRC told banks, trusts, and asset management firms to make their capital pool operations more transparent. But inter-agency coordination has not always yielded effective results. Many capital pools are still operating because banks transferred them to subsidiaries and switched investment targets, sometimes with funds raised through wealth management products. “Wealth management schemes for investing in stocks and bonds issued by brokers are definitely (linked to the) capital pool business,” said a brokerage source who declined to be named. In 2012, the CSRC became the first agency to let financial firms under its wing, including fund managers and securities brokers, offer wealth management products. The following year and in 2014, the CBRC issued a similar policy for banks, and the CIRC released wealth management product regulations for insurance companies.